When I started working for the Environment Agency I realised early on that lower level chronic pollutions were not being reported in Birmingham and the Black Country. I wanted to change this by engaging with local community members and encouraging them to take ownership of local brooks and streams that had poor water quality. In 2012 I developed a project called the Freshwater Invertebrate Network (FIN) with EcoRecord, the local biological records centre for Birmingham and Black Country, to help improve water quality of the rivers and streams that run through these urban areas. For many years watercourses have provided us with information about their health and water quality using tell tale signs such as the invertebrate life that lives there. This is the basis of FIN - helping existing volunteer community groups to take care of their local rivers and streams. 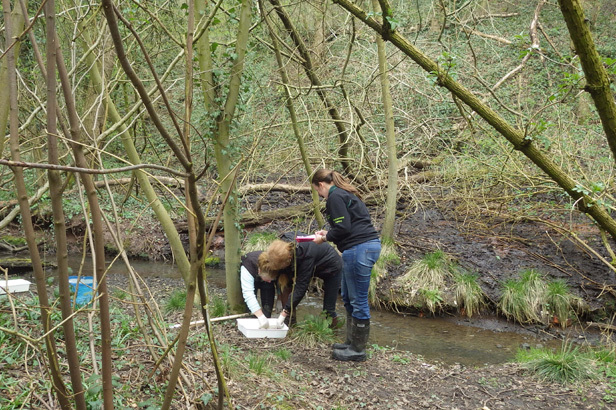 EcoRecord, with support from our environment officers, provide these groups with the skills required to monitor the health of their streams by sampling the freshwater life it contains. The Saltwells Support Group is the latest bunch of budding surveyors to join FIN. They are a local community group who help to support the local authority rangers manage Saltwells Local Nature Reserve near Dudley, with practical volunteer events, public events and now sampling for stream life. Their first training workshop took place on 30 March 2014. 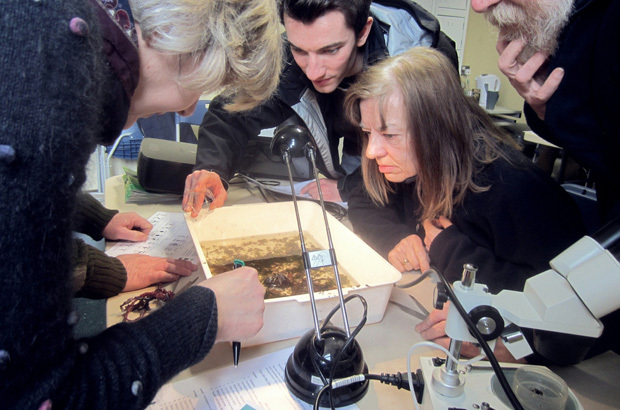 We trained the volunteers how to take a sample for invertebrates, then identify and record the number and type of invertebrates at set sampling points along their local stream, the Black Brook. The session included an identification workshop with microscopes, an interactive presentation and the practical session: kick sampling and collecting to really practice those new skills. They had a great time! The group have been given the equipment they need to be able to carry out monitoring: a net, white plastic tray, eye glasses, sample dishes and identification cards which show pictures and short descriptions of each invertebrate species. This enables groups to develop their own monitoring schedule so that they can do it when it suits them. The groups then submit their results to us and the local records centre (EcoRecord). The groups also report any incidents of pollution and any other issues on their local watercourse. FIN is a special project because some of the best surveyors – local people who know the area - are being trained to keep an eye on the health of their local stream. EcoRecord keeps the data of all the records submitted so that we have up to date biodiversity information. For more information about the Freshwater Invertebrate Network visit their website or follow them on Twitter.